Buying a Graphics Card can be tricky matter because graphics cards come in different sizes, specifications, features and performance. Also there are other factors involved too and you have to make sure that the graphics card you are getting should go nicely with your PC. Nvidia and AMD are the major companies that make graphics cards GPUs, however there are various graphics cards manufacturers that makes graphics cards using their GPU. 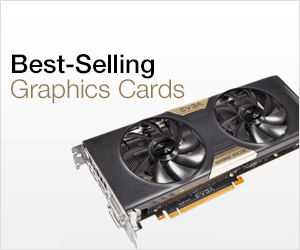 Different manufactures offers different variants of graphics card based on the same GPU. Some brands offers better cooler; some graphics cards comes with higher overclocking and so on. You must be very sure about your requirements and PC specs when choosing a graphics card, because graphics cards are not cheap and if you chose a wrong one and it did not fit in your requirements then you will be wasting your hard earned money. There are many factors involved when choosing a graphics cards, so here I am going to provide you the complete graphics card buying guide. 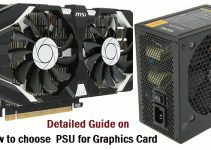 This guide will help to you pick the perfect graphics card for your needs whether it is gaming or professional graphics work. Here are the various factors and points that you should keep in mind when buying a graphics card for your PC. The first thing to find out before buying a graphics card is your budget. This is because graphics cards come in different price range. Entry level graphics cards are cheaper and mid-range and high-end graphics cards are expensive. Also in each range or segment i.e. entry level, mid-range or high-end there is price variation depending on the graphics card manufacturer. So you should fix your budget or price range first when choosing a graphics card. Below you can check out best graphics cards under different budget. The next step is to know your requirements i.e. 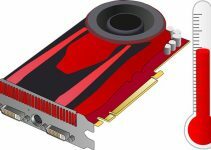 whether you want graphics card for gaming, video editing & normal graphics work or for professional graphics applications such as Autocad, Solidworks, Maya 3D etc. If your main requirement is gaming then you should get a mid-range to high-end gaming graphics card. For video editing and basic graphics softwares you can opt for budget to mid-range graphics card but if you work involves running high-end 3D modeling & engineering softwares or professional graphics softwares then you have to look for workstation graphics cards. Nvidia and AMD are the two major graphics card GPU manufacturers in the world. Both of these are highly reputed and big companies and offer great graphics cards for different range and budgets. GPUs from Nvidia and AMD have different GPU architectures and are completely different from each other in their working and technical aspects. You cannot compare Nvidia and AMD companies as whole because anyone can be on top at a particular time. But you can compare a particular graphics card from Nvidia to AMD in the same price range to evaluate their performance and then can choose the one having better performance and features. GPU or Graphics Processing Unit is the heart of graphics card. Newer the GPU, the better is its performance and also it will consume lesser power compared to the older GPUs in the same segment. Latest GPU will also provide you newer features and support for latest APIs. You can look at the Nvidia and AMD official website to find out which GPU is latest or which GPU architecture it is using. So when buying a graphics card, just make sure that it has the latest GPU in it. You also have to know about rebranding, re-badging and refreshing of graphics cards which can learn about by going to the link given below. VRAM or Video Memory is also an important component of graphics card. Currently the different types of video memories for graphics card include DDR3, GDDR5, GDDR5X, HBM and HBM2. DDR3 is the slowest of all and is used in entry level graphics cards only. GDDR5 is the most widely used video memory for graphics cards and is used in budget, mid-range and high-end graphics cards. GDDR5 is much faster than DDR3 memory and it also has greater bandwidth. GDDR5X is the updated version of GDDR5 memory that is almost twice as fast as GDDR5 memory. It is currently used in top-end graphics cards only such as Nvidia Titan Xp, Nvidia Titan X, GeForce GTX 1080 Ti and GeForce GTX 1080. HBM and HBM2 are the next generation High Bandwidth Memories that requires less space on graphics card PCB, consumes less power and offers much higher bandwidth compared to GDDR5 memory. HBM and HBM2 are used in top of the line graphics cards only. HBM or HBM2 is the future of graphics card memory and they are the preferred memories for VR applications or games. Also the amount of video memory on graphics card matter too, especially in mid-range and high-end graphics cards. A good graphics card having 2GB video memory can only be good for up to 1080p resolution only, and if you want to play games on 1440p and 4K resolution then you must get a graphics card with 4GB or more video memory. Graphics Cards comes in different lengths and sizes. 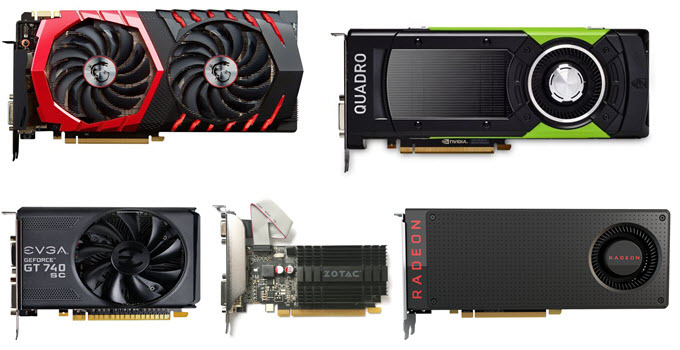 Some graphics cards are big, some are compact or shorter in length and some are slim or low profile. The graphics card you are getting should be able to fit inside your PC case otherwise you have to buy a new computer case. If you have a low profile or slim computer case then you should get a low profile graphics card. For mini-ITX case or SFF case, you must buy a compact or small form factor graphics card. For other computer cases including mini-tower, mid-tower and full-tower cases you must first verify the length of graphics card your case supports and then buy the graphics card accordingly. Every graphics card comes with a cooler to keep the temperature of its major components i.e. GPU, VRAM and VRM down to safe levels. Graphics Card cooling is categorized into two i.e. active cooling and passive cooling. Active cooling consists of Heat Sink Fan (HSF) or Liquid / Water Cooling whereas Passive cooling only has Heatsink to cool down graphics card. Almost all the graphics cards come with active cooling solution because it offers better performance and does not make the card heavy or bulky. On the other hand only entry level graphics cards and few mid-range graphics cards employ passive cooling. Graphics Cards with passive cooling or heatsink are completely silent operation and they make a great choice for a HTPC or Home Theatre. In Active Cooling more the number of fans, the better will be cooling but it will also generate a bit more noise. Also if you want to overclock your graphics card in future then it is better to buy a graphics card with better cooling solution having two or three fans or if you have not budget issues then get a water cooled graphics card. There are different manufacturers or brands for graphics cards. Each manufacturer has their own version of graphics card for the same GPU and their performance and price always vary. The most popular and reputed brands or manufacturers of graphics card include Asus, MSI, EVGA and Gigabyte. Some manufacturers overclock their graphics cards and fit them better coolers compared to others. Graphics Cards from lesser known brands are few dollars cheaper but it does not mean that they are not good. So if you are brand conscious then go with the reputed brands but if you are on budget then you can also go with other brand which is offering the cheapest deal for the same GPU. Make sure that the graphics card you are getting support the latest version of all the major graphics APIs that include DirectX, OpenGL and Vulkan. This is because all the latest games are based on one of these APIs and if your graphics card does not support the latest API version then you may have to compromise on graphics eye candy and may be performance in latest games. All monitors are supported by all graphics cards for general use but when it comes to gaming then it is a bit different story. This is because of the support for G-Sync and FreeSync technologies. G-Sync and FreeSync are variable refresh rate technologies that eliminates the problem of screen tearing, stuttering and provide you smooth gameplay without any artifacts. G-Sync technology is from Nvidia and FreeSync is by AMD. If you have a G-Sync monitor then you will need a G-Sync ready Nvidia graphics card for it and for FreeSync monitor, you need an AMD Graphics Card that support FreeSync. So if you want the best gaming experience then you should keep this thing in mind and buy the graphics card accordingly if you don’t want to change your monitor. 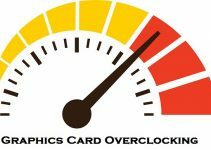 Display Outputs on graphics card can vary from card to card depending on the manufacturer. Some graphics cards have more HDMI ports than DVI and DisplayPort while some have more DisplayPorts or DVI ports than HDMI. Make sure that the graphics card you are buying have display ports supported by your monitor. My advice is to buy a graphics card having all the three digital ports or connectors i.e. HDMI, DVI and DisplayPort (DP). Power Consumption may be a factor when buying a graphics card if you don’t want to change your power supply. If your power supply is too weak then you have to buy a new power supply but if your PSU is powerful enough and if your graphics card come with either 6-pin or 8-pin connector but your PSU don’t have any, then you can use 6-pin or 8-pin adapter cables to power your graphics card. At the end I would only like to say that if you follow this guide then you will surely pick the right graphics card for your PC. If you still have any queries or still can’t decide which graphics card is best for you, then you can ask me by leaving a comment below.